Chop cheese into bite-sized pieces about the length of the burgers. Set out crackers on a serving plate and add a squirt of ketchup and mustard to each. In a skillet on medium heat, warm 2 tablespoons of oil. Place burgers in skillet and cook thoroughly. Place small cheese slices on each toward end of cooking, to let it melt before removing from skillet. 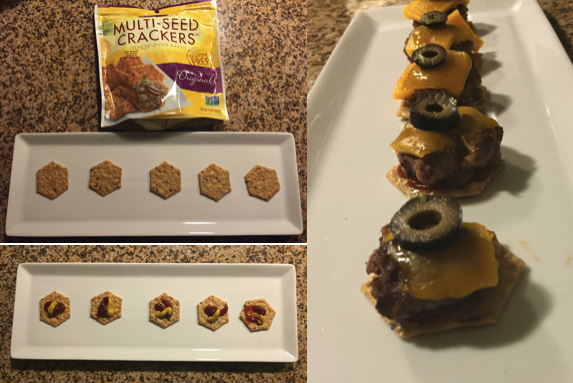 Place one cheeseburger on each cracker, topping with a black olive. Be sure to print this Crunchmaster Coupon!